Using three Kenyon gyros (two KS8s and a KS12), my new gyro mount has Engineering Instructions for use in twelve AS350/355 helicopters based in Hobart (Helicopter Resources and Rotor-Lift Aviation) and Latrobe/Devonport (Tasmanian Helicopters) . Additional aircraft can be added to the EI for a fee. Introductory hire rates are AUD$790/day in the Hobart area, which includes on-site technical assistance for set-up and operation. Cameras under 9 kg total weight can be stabilized. Additional charges will apply for travel outside the Hobart area. Interstate enquiries welcome. 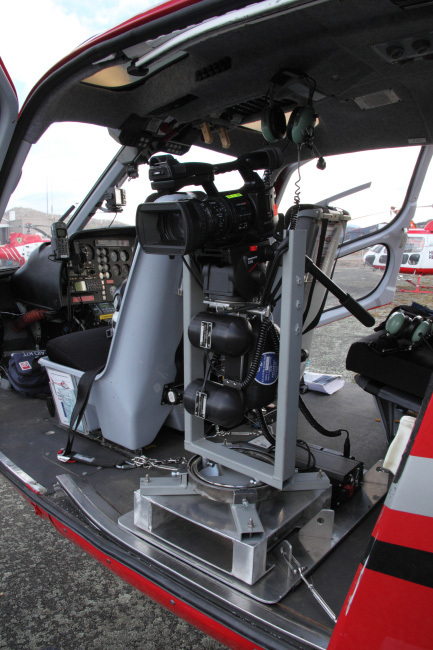 The mount provides excellent stabilization for aerial video shooting HD, 2K, 4K, 5K (RED Epic). Forward aerial tracking shots, mimicking the classic nose-mounts (eg Tyler, Cineflex) can be achieved by crabbing the aircraft sideways (examples below), but at a fraction of the cost. The mount provides an affordable solution to budget film-makers who want to shoot aerials, but don't want "wobble-cam", or having to throw away pixels in post using SmoothCam or other software solutions. Although designed primarily for aerial use, the mount is versatile enough to be mounted on any moving vehicle. I am currently trialing a modified wheelchair, which allows the unit to move over moderately uneven surfaces in confined spaces, providing long tracking shots without laying track (see demo below). Shot using a Canon 7D on my gyro stabilized camera mount, which itself was mounted on a wheelchair base. The tarmac was very rough, but the shot is pretty smooth. Used as a DVD intro for a safety video for the S76 helicopter. Highlights from my recent Antarctic trip, where I had the opportunity to use my gyro mount shooting stock footage for the Australian Antarctic Division. This is a short clip showing what my gyro-stabilised camera mount is capable of... or more importantly I guess, demonstrating that it works! The rig is fixed in the back of the car, with the bearing allowing movement in yaw limited so the camera always faced the front of the car. What is obvious here is how much the car moves relative to the camera... what is less noticeable is how stable the shot is out of the front window. Whereas the car bounces around as we travel over Tasmania's exceptionally ordinary roads, the camera remains relatively unaffected, producing a stable view of the road ahead. A few shots from a recent flight in Antarctica using my 3 Kenyon gyro mount. The first part is the raw footage, and the second is the same shots with SmoothCam applied in Final Cut Pro. Shot using a Sony EX3, from an AS350B2 Squirell. This was the first test run of my gyro stabilised camera mount. Shot on a Sony EX1, the flight was a bit of a shakedown, to ensure the mount fitted and worked in the aircraft (AS350 Squirell), rather than an attempt to make a wonderful showreel. The clip has been further "smoothed" courtesy of FCP smoothcam filter, which is a useful tool, especially when a huge amount of the work has already been done during acquisition. The opening shot demonstrates the ability to get a good, stable forward tracking shot by flying sideways.